Clipper has launched a pilothouse layout for its popular 52 Cordova Series II. The pilothouse is a new option for the internal layout, offering the crew a dedicated navigation station forward, beside the helm. The navigation station includes a wide, upholstered bench seat, fold-up working table and space to spread paper charts. 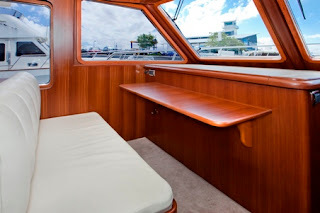 To accommodate the navigation station, the Clipper design team moved the galley aft, and redesigned the saloon to offer a U-shape lounge with a multi-purpose dinette table. The dinette table slides out for easier access and is mounted on a gas strut pedestal. The table can be lowered to create a coffee table effect or to operate as the base for a cushion that turns the lounge into a generous double bed. Of course, the Clipper 52 Cordova with the pilothouse option maintains all the classic Clipper features including the three double cabins, walk-around decks, side and aft boarding doors, stainless steel sliding aft saloon doors and air conditioning throughout.